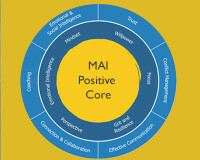 The MAI Positive Core™ gives our clients an immediate understanding of how they prefer to work and communicate and provides effective language to describe themselves. They receive insight into how they might be perceived by others, and gain clarity on why others might behave the way they do. When we truly recognize and leverage our strengths, we have the greatest impact. Constructive, effective and inspiring. 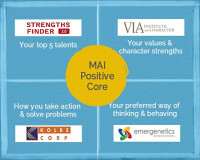 The MAI Positive Core™ is the foundation of our MAI Team™ and MAI Coach™ programs. While it is most powerful when used with our workshops and coaching offerings, it also stands alone as a tool to help individuals gain a deeper understanding of their strengths, motivators and capabilities. We don’t ignore weaknesses. Everyone has less-than-stellar attributes, and we all engage in some misguided ways of approaching the world. We have found, however, that weaknesses are often strengths overused, analogous to the “red zone” on a speedometer. Learning to properly calibrate our strengths is crucial. In our workshops, participants gain an understanding of the power of complementary team profiles as an additional tool in managing individual weaknesses. Ultimately, individuals are most effective when they take action in ways most authentic to themselves. Honesty, or authenticity, is the most admired trait among leaders, and garners the highest degree of engagement from their followers. 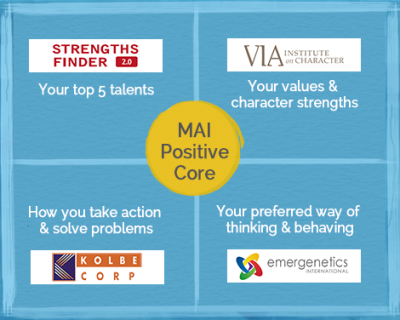 Tying these factors together and having everyone in an organization work from their MAI Positive Core™ makes profound business sense. Exceptionally effective people are masters of themselves. They are keenly aware of what they can control and what they can’t, stemming from a mental stance of rational optimism. They believe that their capabilities can be expanded through acquiring and applying knowledge and practicing skills. They exercise self-control in working towards longer term priorities appropriately balancing their shorter-term impulses. They manage negative emotions effectively and are able to pick themselves up after a setback. Lastly, they show exceptional grace under pressure, aware that their view of the world is only a sliver of the possible perspectives one can bring to any situation. We call these Capacities of Self-Mastery, and they can all be expanded through increasing knowledge and deliberate practice. Progress in one area often feeds into another in a virtuous spiral. At the same time, none of us lives in a vacuum. We need to be able to get on and work effectively with a variety of other people. As we progress, our success becomes increasingly dependent upon the efforts of others, requiring collaboration to accomplish our goals. We need to communicate clearly and diplomatically, and deal with conflict appropriately. Successful people build deeply trusting relationships. They lead by example and actively encourage others to deploy their own unique talents and strengths. Like the Capacities of Self Mastery, these Capacities of Leading and Influencing Others can also be developed through a combination of gaining insight and taking action. We thrive when we love what we do every day, enjoy high quality relationships, are secure in our finances, have vibrant physical health and pride in what we contribute to our families, friends and communities. The true sweet spot is when all these are humming along together in a symphony of interaction. While two thirds of us are doing well in at least one of these areas, only a fraction of us are doing well in all. 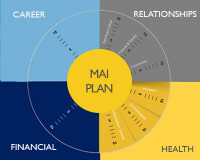 MAI Plan™ is designed to help you do just that: thrive in all areas of your life. It’s a values-based planning tool to bring focus and clarity to all four domains: Career, Relationships, Financial and Health.